Thinking about renovating your home? Then this comprehensive guide is for you! Home renovation is no simple task. 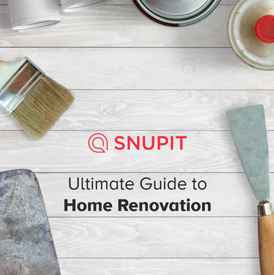 Thankfully, we’ve collected everything we’ve learnt from years of dealing with customers and contractors to help you avoid the mistakes that cost you time and money and give you renovator’s regret. Best of all – it’s completely free! Simply click the download button below and it’s all yours, with love from Snupit.